One of the longest standing traditions in Southern California, the Rose Parade is known as America’s Happy New Year’s greeting to the world. This year, forty-some floats will glide down Pasadena’s Colorado Avenue starting at 8 a.m. onJanuary 1, each decorated according to the overall theme of this year’s parade: “inspiring stories.” The prestigious honor of Grand Marshall has this year been bestowed posthumously on World War II veteran and Olympian Louis Zamperini, subject of the Angelina Jolie-directed Unbroken, currently in theaters. Anyone who has attended the Rose Parade knows that it’s all about showing up early to get a good spot. You can stake your claim starting on New Year’s Eve but blankets and chairs must remain on the sidewalk until 11 p.m., at which point it’s safe to move out into the street (although spectators are asked to respect the blue honor line). The 5.5-mile route is typically congested around the starting area, so you may have more luck scoping out a spot further up Colorado Ave. The grandstand has about 70,000 seats available, which may be reserved through Sharp Seating. 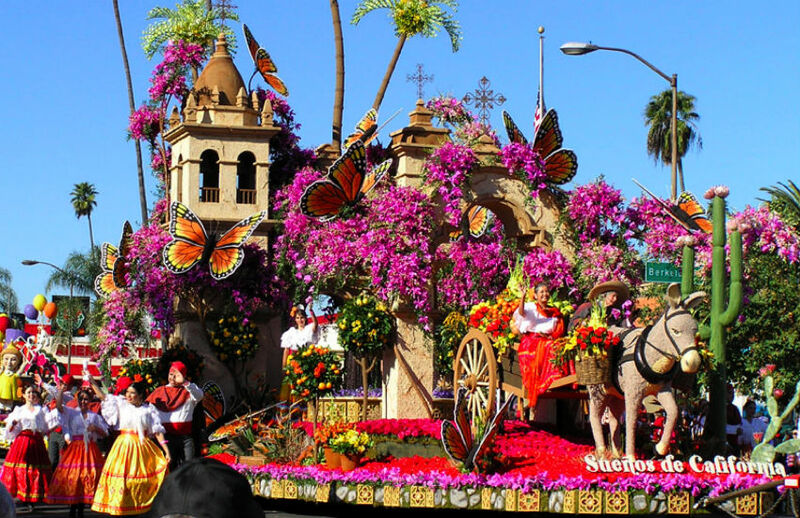 We can’t wait to see the parade entries in all their floral glory. Here are six floats we’re particularly excited to see. 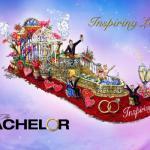 ABC’s The Bachelor is a fan favorite at this year’s Rose Parade. Decorated with more than 25,000 roses, the symbol of love (ironically, on the show roses are usually associated with the rejection-filled Rose Ceremony, in which the proverbial bachelor picks his bride). The float riders will consist of, among others, three couples (including the original Bachelorette Trista Sutter and her husband of eleven years, Ryan), who’ve found love on the show. The theme within the theme is community. The Life Starts Here float features a vibrant city complete with a refurbished green space, a community vegetable garden, a produce stand, and a pollinator’s garden. 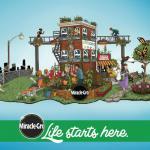 The float is part of Miracle Gro’s 1000 Community Grant Award, a program intended to develop over a 1,000 community gardens and green spaces in four different cities across the country. 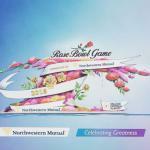 Northwestern Mutual is going all in this year. Not only is this their first time sponsoring a float at the Rose Parade, they’ve commissioned two separate floats: Celebrating Greatness and Inspiring Potential. The former, a homage to the Rose Bowl itself, is shaped like giant bouquet of flowers. 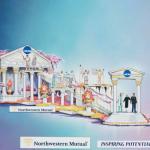 Inspiring Potential salutes the NCAA, with a long staircase—a visual metaphor for the journey of successful student athletes—as the centerpiece. Design-wise, the float gives a nod to the Olympics with columns and arches inspired by antiquity. 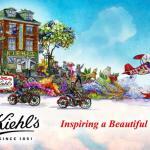 Using building materials like sesame seeds, black seaweed, red winterberries, and dehydrated carrots, Inspiring a Beautiful World by cosmetics brand Kiehl’s Since 1851 recreates the original Kiehl’s apothecary in New York’s East Village. Other awesome features? Check out the biplane made from coconut flakes, red carnations, and blue sinuata statice! 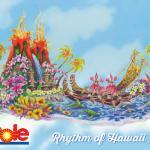 The Rhythm of Hawaii float is one of the most impressive at this year’s parade. 12,000 iridescent orange roses decorate an island landscape complete with not one, but two volcanoes that will spew actual fire (how they managed that one, we don’t know). Giant shells decorated with sesame seeds, pinto beans, flax seed, as well as bobbing canoes and jumping dolphins will complete the South Pacific vibe. Previous articleWho Was General Tso and What’s the Deal with His Chicken?